The liver serves as both a factory for manufacturing and storing essential chemicals, as well as a purification system which rids the body of toxins, bacteria, and viruses, while improving digestion and metabolism. That's why so many health professionals recommend strengthening and protecting the liver. Dandelion - improves toxin neutralization, impedes bacterial growth, prevents absorption of heavy metals and radioactive elements into the soft tissues, increases bile production, aids indigestion, and acts as a diuretic. Milk Thistle - counteracts toxins that cause bleeding, lowers fat levels in the blood, blocks cellular penetration of toxins, and neutralizes free radicals. Calendula - increases bile production, widens blood vessels, lowers fat levels in the blood, and stimulates phagocytosis (the process by which the cell membrane engulfs foreign bodies, absorbing them in the case of nutrients, while destroying them in the case of toxins, bacteria, and viruses). Turmeric - neutralizes antioxidants with exceptional efficacy. Licorice - acts as a muscle relaxant, anti-allergenic, and antioxidant, strengthens the spleen, counteracts toxins, stimulates prostaglandin production, impedes bacterial growth, and strengthens the immune system. LIVER UP is especially recommended for people who are on medication and/or who suffer from: skin irritations (itching, rashes, acne), skin diseases, allergies, a compromised immune system, fatigue, or constipation. Dosage: For adults, 3 times a day, 40 drops for half a glass of water. PLEASE NOTE: It is recommended to drink more water than usual for the first week or two while the body cleanses itself. In addition, one should exercise and eat ripe fruits and vegetables, while reducing intake of fatty foods and sugar. Smoking should be reduced or stopped. Also note that when treating skin diseases, the condition usually worsens for several days as the body begins the cleansing process, before improvement is seen. 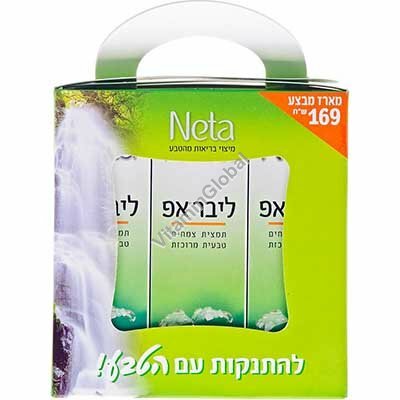 During this period, it is advisable to use Neta's Stopic skin cream to help reduce the irritation.